Welcome to My World (Part 2) | Hujambo! I posted a few days ago about my life in Tala. The main purpose of that was to get some pictures of my surroundings up online, but I ended up writing a lot about life in Tala. I’ve posted at least one “a day in the life” entries in the past, but this is a bit different. I realize most people who read my blog regularly have, by now, formulated their own pictures of what goes on in Kenya. I wanted to continue the trend of showing photos, and I happened to be running errands in Nairobi today, so I snapped some photos around town (embarrassing at first, but I decided I didn’t care after a bit). Hopefully these pictures add some color and correctness to the ones you already had in your head. Enjoy. I like Nairobi, there are a lot of young people and the town has lots of energy. I’ve been to large cities in the countries neighboring Kenya but I’ve never come across a place which felt as fast and forward-moving as Nairobi; just ask any high school or university student in Kenya, new slang is being manufactured every day in tao (“town”… Nairobi). Maybe it’s because I live here, but I really think Nairobi stands out from other capital cities in the region. It’s a great city (don’t mind the “Nairobbery” nickname). One thing that is definitely unique about Nairobi are the matatus. 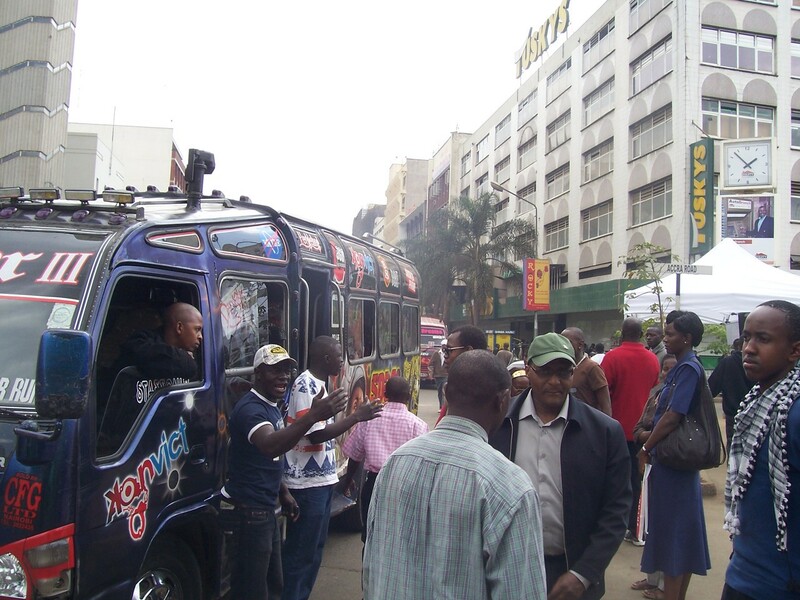 Matatus are public transit vehicles which travel all over Kenya. They are minivans of all shapes and sizes (and even colors…). I don’t know if you realize this, but outside of the United States, not everyone owns a car (shock, I know). These minivans are everywhere in East Africa from what I’ve seen, but only in Kenya do they get completely and utterly pimped. You name it: if it can be pimped, it’s in a matatu. Stickers, lights, flat-screen TVs, subwoofers, paint jobs, engine and exhaust modifications, etc… you’ll find it all in Nairobi. There seems to be a bit of a preoccupation in Nairobi with being a hustler (think of rap music in America), so most matatus have provocative slogans written on their windshields and loud rap music playing inside. Ironically, I’ve learned more about American hip hop/rap since I’ve been in Kenya than my whole life actually living in the United States. The matatu industry seems to have become somewhat of a competition; young people will stand waiting for a sweet ride while several ‘normal’ ones pass by (they’ll even pay more to ride in a mat where the music is so loud that you can’t hear yourself think, me included). 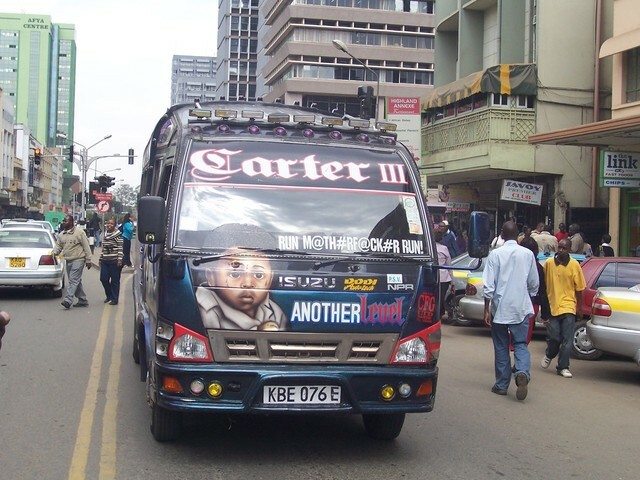 Certain routes are known to have the best pimped-out matatus. If you’re in town, hop on a mat headed for Westlands (route 23), Umoja (route 60/35), Buru Buru (route 58), Eastleigh (route 6 or 9)… For example: I have been seeing matatus in Umoja recently with satellite dishes on top. I’m pretty sure they don’t actually do anything, but it’s pretty wild to see those things driving by. 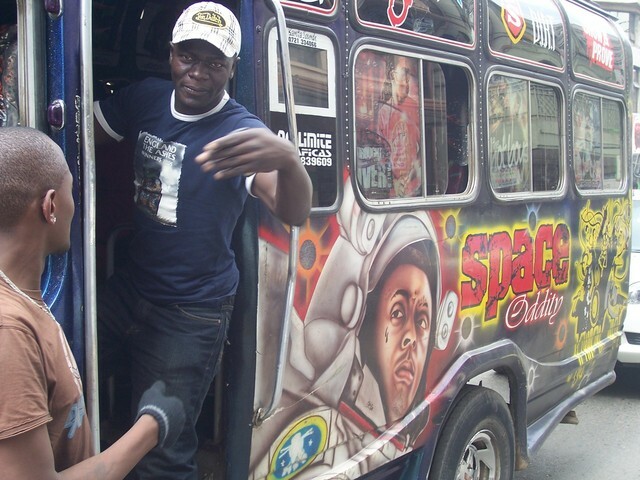 As I was walking around Nairobi taking pictures I made friends with a dude who works as a makanga (like “conductor”) in a certain pimped-out matatu. He was excited when I started joking with him and dropping some sheng (Swahili/English slang used in Nairobi), and then he told me to come and see his vehicle. Yes, that is a forty-something inch TV on the inside and another on the outside for all the people on the street to watch music videos as the matatu drives by! The job of the conductor is to hang out by the door and yell, “Beba beba, mbao” (literally, “carry carry, twenty shillings”) and to let people on and off at various points along the route. There are so many other things I should write about Nairobi, but I got on a roll when I started on matatus. 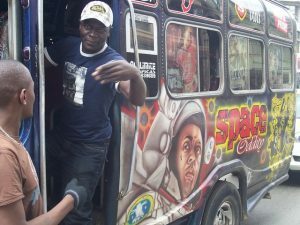 I always thought it’d be good if some creative Kenyans worked with AlJazeera or BBC (or whoever) and made a documentary about Nairobi’s unique culture, especially the matatu phenomenon. Oh well, the world will just have to be satisfied what I and others have written. I’d say you’re right. Judging from the fact that I see major overhauls of matatu pimp factor every few months, they are way more pimped out than when you left around a year and a half ago! Only in Kenya, baby… such a strange phenomenon which doesn’t exist yet in Tanzania, Uganda, Rwanda, or Ethiopia.